Rainbow Chimes Early Childhood and Care Center in Huntington offers high quality day care to the community around Huntington Long Island. We use the High Scope Curriculum, which is based on the work of renowned child psychologist Jean Piaget. How this curriculum is implemented looks different depending on what age group you see it used with. For our happy little preschoolers, it takes on a busy interactive look. Our classrooms provide lots of hands on experiences for the young students. Our classrooms are cognitively focused, meaning the children are not rotely taught but learn from hands on experience. All learning centers around 58 key developmental indicators. Socialization and kindness are encouraged throughout the day. There are areas of individual and group learning. 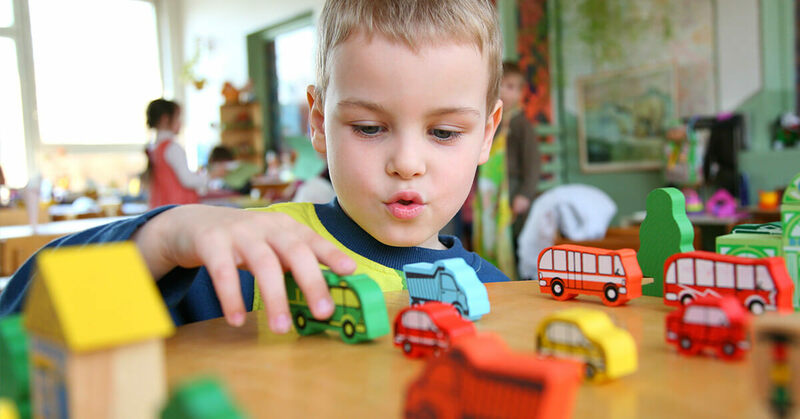 Play centers include puzzles, blocks, trucks, dolls, table toys, games, musical instruments, tools, prop boxes as well as home play and nature play areas. Our teachers are chosen for their friendly, positive manner in engaging children. Ratios of 1:6 or 1:7 on the preschool years depending on the ages of the children. Every day, parents will receive notes about how their child did that day. Classrooms are monitored through CCTV and there are intercoms in case teachers need extra help. Yes, our classrooms are busy, sometimes noisy places, but they are not unstructured and chaotic. Floors and rugs are cleaned everyday and toys and furnishing are washed and inspected on a strict schedule. Children learn through play and through structured learning. If you’d like to tour our day care facility, click here to schedule a visit.